MADE TO ORDER - PLEASE ALLOW 5 DAYS TO SHIP! This kit contains 123 pieces. It is normal to have small gaps between each graphic. This is not a vinyl wrap, it is a high quality graphics kit. 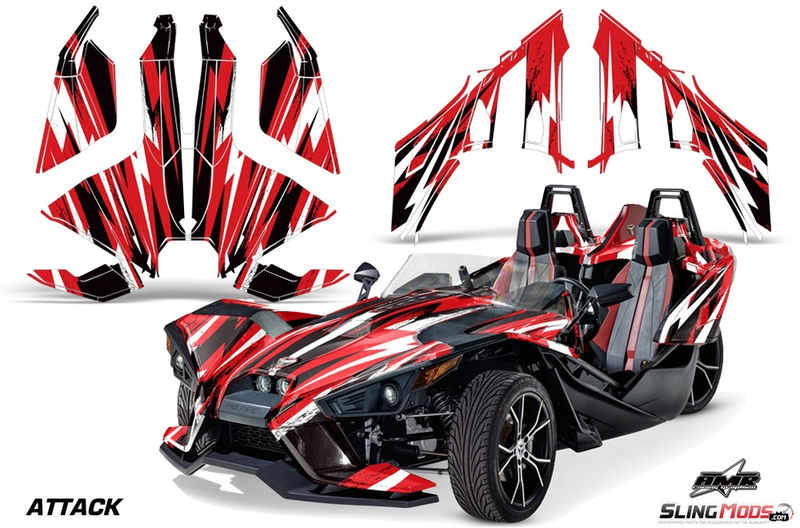 Set yourself apart from other Slingshot owners with these High Quality Graphic Kits from AMR racing. 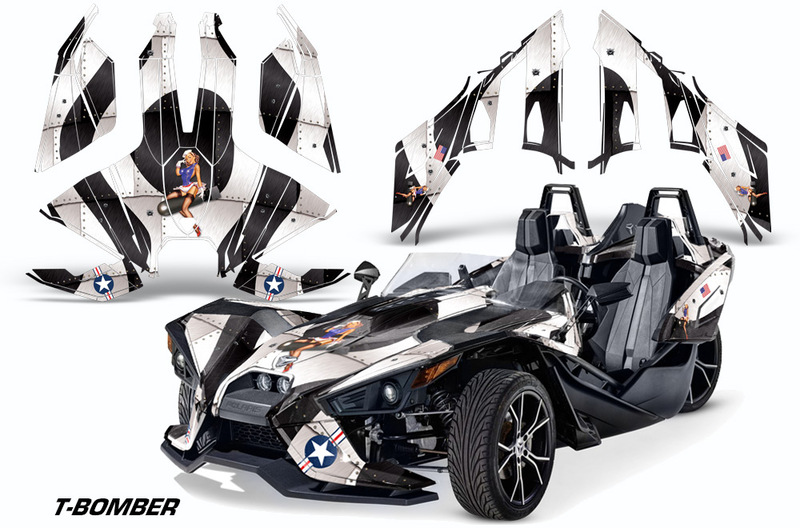 The AMR graphics are printed on 20-Mil, 3 Layer, decal material. 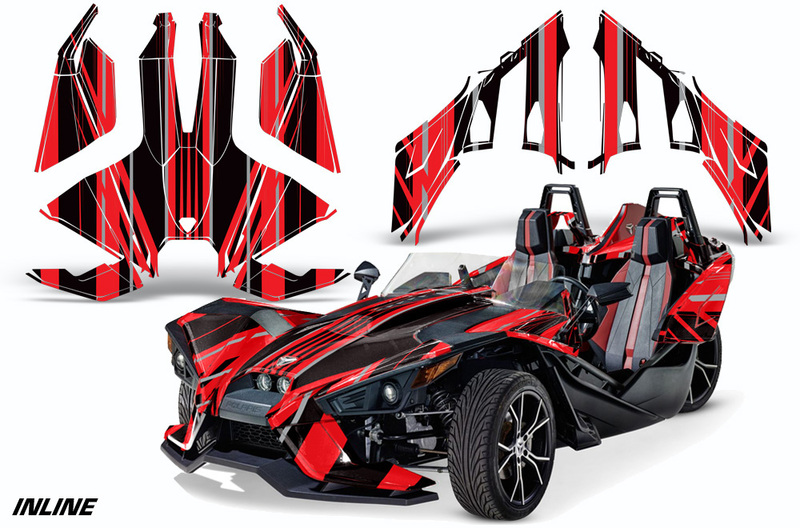 These graphic kits are printed on 3M vinyl with UV resistant inks that will prevent fading for up to 5 years. This product is scratch proof, fade proof and literally wreck proof. 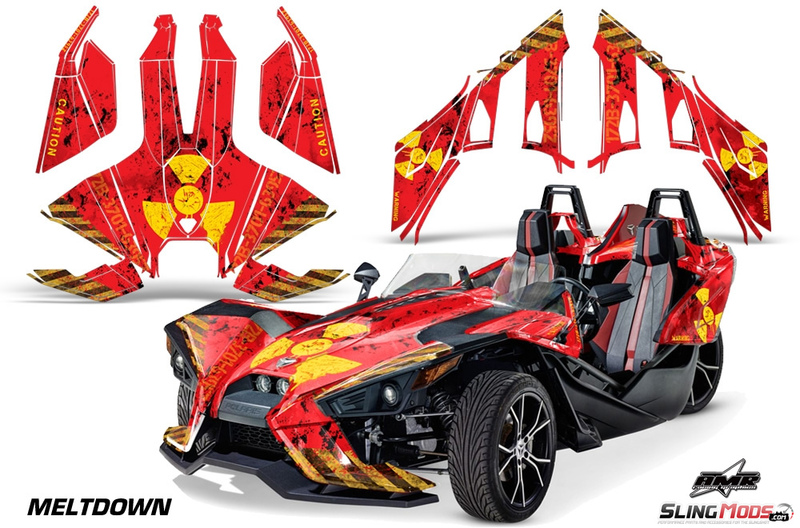 Due to the thickness of the material used on these AMR graphic kits, rest assured that your paint is now protected from flying road rocks and pebbles with an armor-like layer of protection. - If possible, have a professional install your graphics kit. 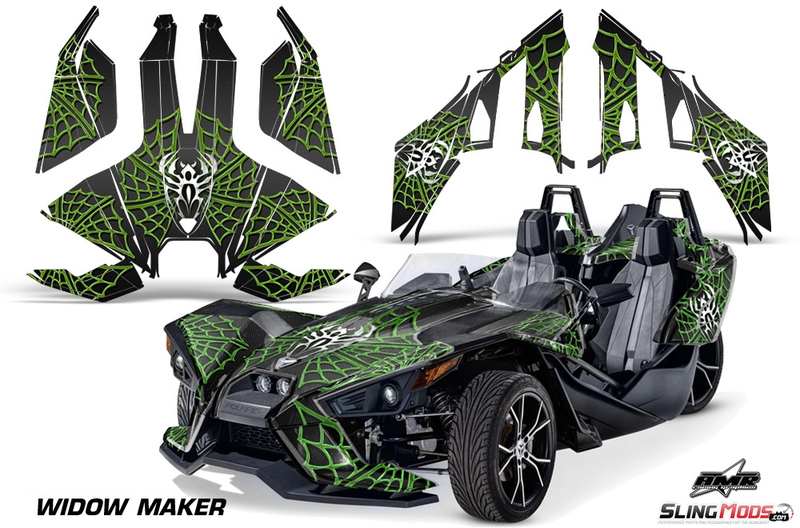 If you decide to install the graphics kit yourself, the kits have been designed with the DIY home user in mind and are possible for anyone to install by following the steps below. 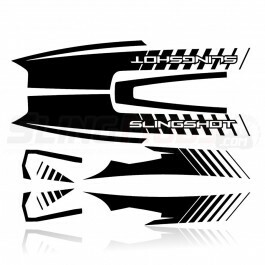 - Please install your Slingshot Graphics Kit on a day where the temperature is between 60-100 degrees fahrenheit. 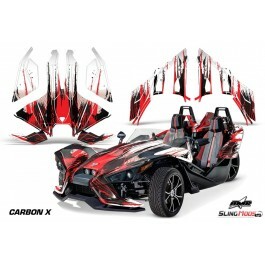 - Take your time and plan on spending a few hours to install your graphics kit. - Spray Bottle filled with a mixture of water and a few drops of dishwashing liquid. 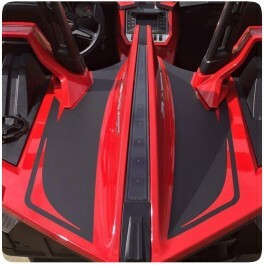 - Throughly clean all panels on your Slingshot. We recommend wiping clean the plastic panels with Isopropyl alcohol to remove any debris and to insure maximum adhesion of the graphics. 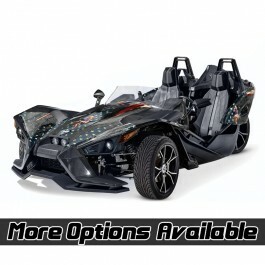 - Identify all parts of the kit to be installed before starting. Hold them up to the corresponding body panels so you understand where and how they need to be placed and how the artwork intersects. If you have panels that will have merging artwork from two different pieces, examine how the artwork will line up with each graphic at the junction points. There is normally a gap in the artwork to get it to line up correctly. (Some parts are not intended to line up). - The water bottle you're using should only have about 6 drops of soap for the entire spray bottle, the rest is water. Soapy water is recommended for larger pieces larger than 1.5 ft. in diameter. Spray down the area with the water / soap mixture and float the graphic on the surface area. Once you're satisfied with the placement of the graphic for that location, use a squeegee to remove excess liquid and air bubbles. - You should start with the largest part of the graphic and work into the smaller pieces, as the smaller pieces are easy to maneuver. You should also start from a high point and work downward if possible to allow the water to flow downward when you use the squeegee. - Apply heat from a blow dryer or heat gun to remove any wrinkles or air bubbles after the installation of each piece. Please be careful no to apply too much heat as the material can deform and stretch up to 1 inch with too much heat. - After the entire kit is installed it's a good idea to apply moderate heat to each graphic with a good rub across each graphic and each edge. This final heat allows the adhesive to "set" and lock the graphic in place. You can use a non abrasive cloth to apply even pressure across the entire graphic as you apply heat to make sure it tightly bonds to the surface. 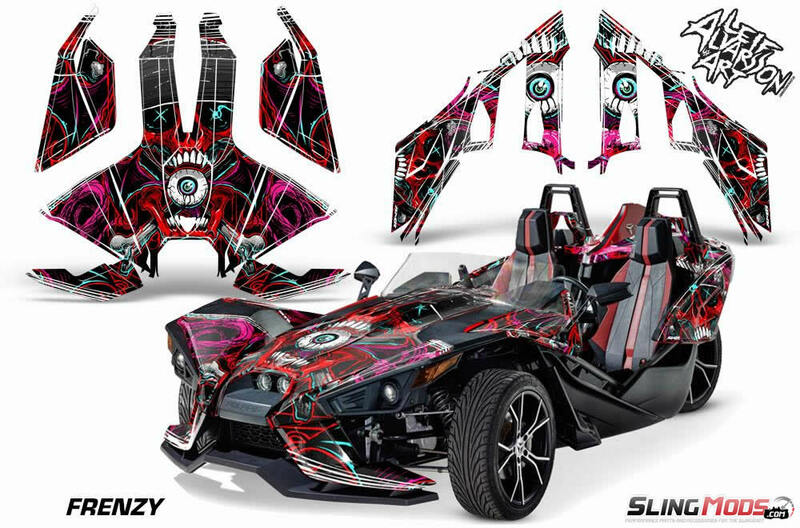 - Allow the graphics to sit for 24 hours before driving your slingshot to properly allow the adhesive to set. Haha. Hello Joe, yes artwork can be removed from any of the AMR Graphic layouts. AMR does charge a nominal fee to edit the graphic. I purchased the ''In Line'' kit over a year ago. All was perfect until we decided to take them off to change the look of the SS. OH MY GOD!!! I called AMR to get the official procedure to take them off and they said just heat the sticker and use plain old rubbing alcool with good old elbow grease to take the glue residue off! What you have to know if you plan on purchasing these kits is that it's OK if you plan on keeping them on forever but if you want to take them off at some point...GOOD LUCK! I'm in the process right now and spent 8 hours yesterday just to take off and take the glue off of 4 pieces of the kit!!! I still have a ton of them to take off and my fingers are killing me from yesterday's rubbing like crazy to take the glue off. If I would have known it would be this hard to take off I would have never put the kit on in the first place. So be warned, If you think of these as a temporary look...DONT DO IT! You will regret for sure. The material within the kit fails to properly cover all of the body, which makes it look weird as hell. Even having it installed by a professional installer did not help. 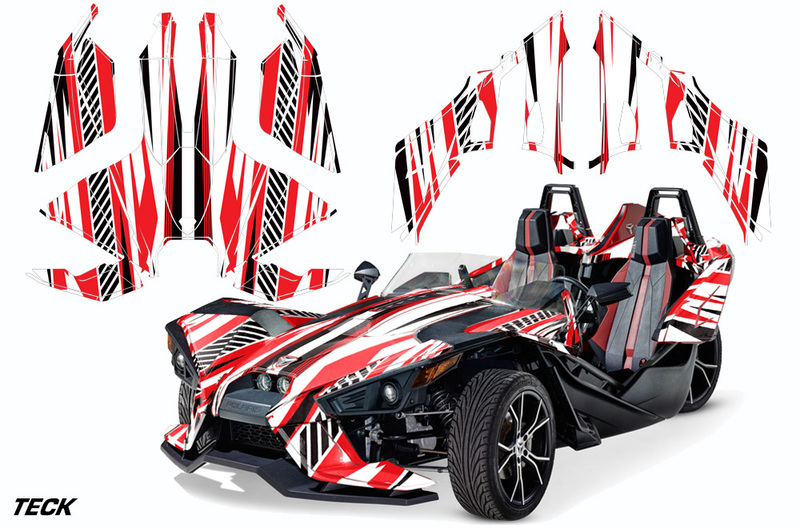 I would not suggest that anybody buy this wrap kit. 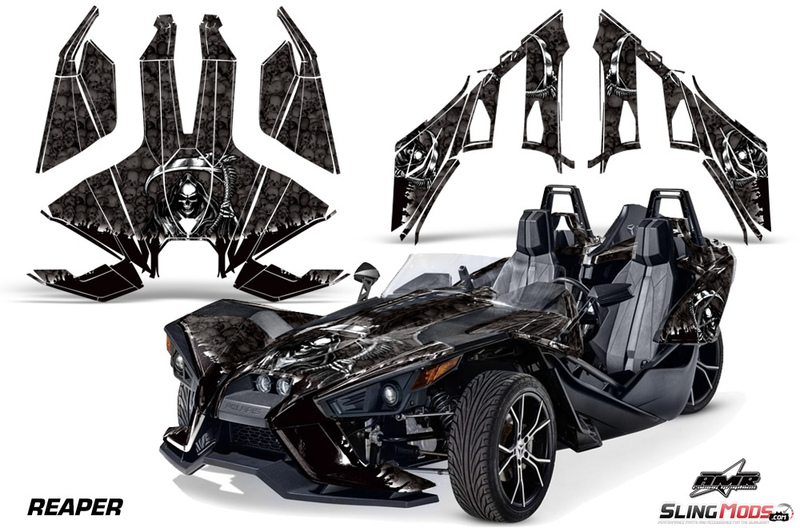 I purchased the black and grey reaper. Just to start with it looks amazing, i 22'inch chrome rims on the back and top. 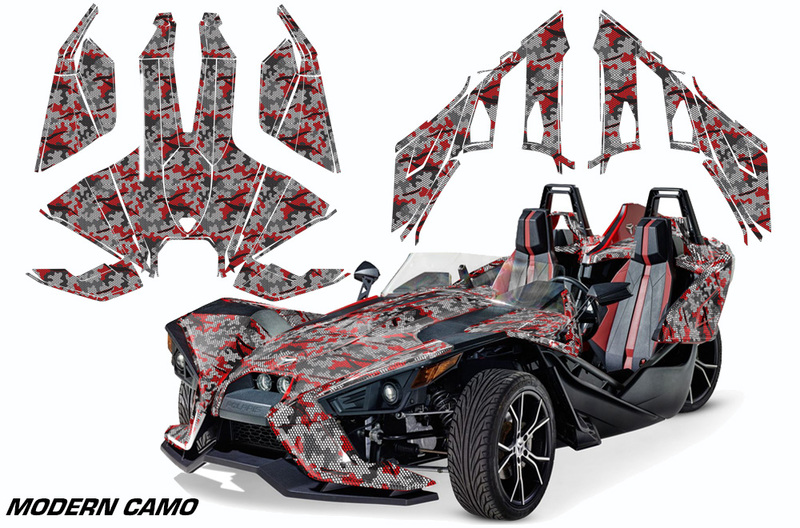 The graphics just makes the vehicle stand out even more. The installation process is easy and you must take your time. First recommendation is not to rush and consider it a weekend project. As all the other post the most challenging part is figuring out where everything goes. Only negative it should be some diagram to help but once you go through process of elimination you will eventually find it. The designers did a great job on this and its good quality material. Hope it last the 5 years. 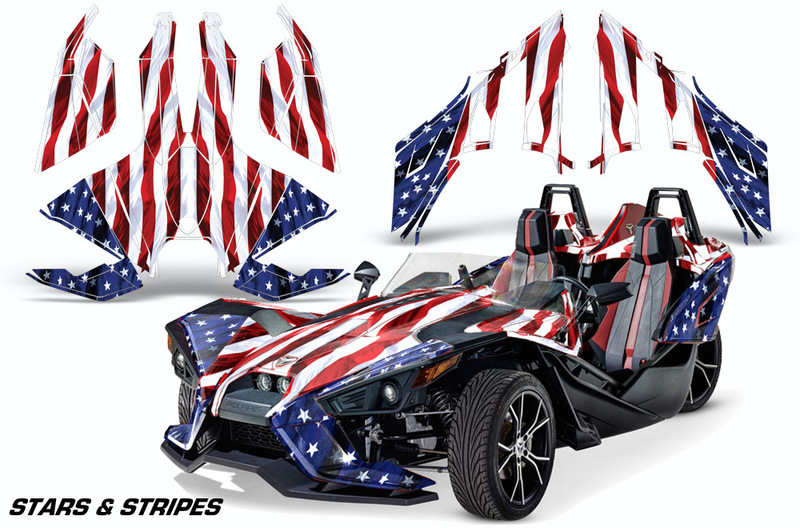 I had the wrap applied when I purchased my Slingshot! 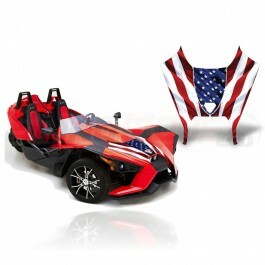 Haven't seen any others like it so it adds a uniqueness that other slingshots don't have. Custom contoured Vinyl Graphics Decal Kit for the Polaris Slingshot..
Pre-cut Templated Hood Graphics Kit for your Polaris Slingshot by AMR Racing..
Set your Slingshot apart from the rest with customizable hood text on this complete strobed graphics.. Customized Hood & Side Panel Graphic Decals for the Polaris Slingshot by AMR Racing..